The China-Singapore Free Trade Agreement (CSFTA) Upgrade was signed on Monday, 12 November 2018 by Minister for Trade and Industry Chan Chun Sing and PRC International Trade Representative and Vice Minister of Commerce Fu Ziying. 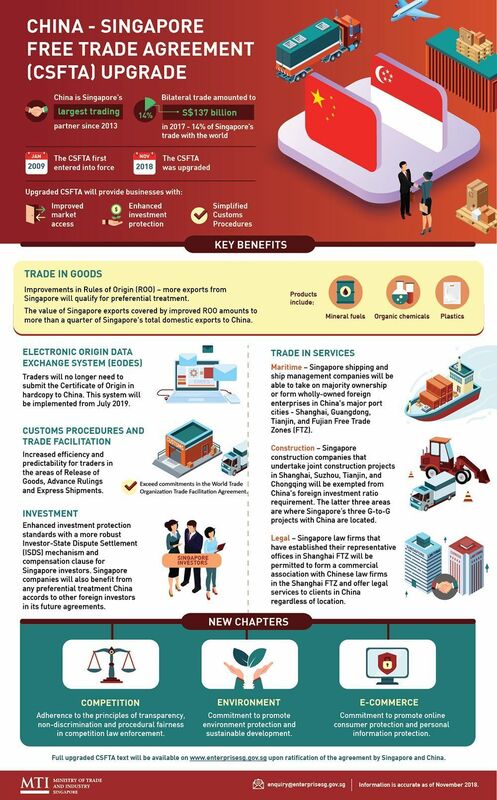 The upgraded CSFTA will provide Singapore businesses with improved access to the Chinese market, enhanced investment protection, as well as simplified customs procedures. China and Singapore will now work towards ratifying the upgraded agreement. Find out more about the CSFTA from the infographic below or contact enquiry@enterprisesg.gov.sg for more information.